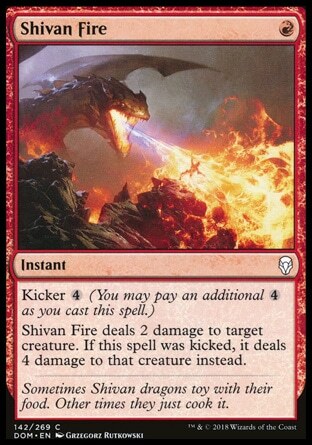 Shivan Fire deals 2 damage to target creature. If this spell was kicked, it deals 4 damage to that creature instead. Sometimes Shivan dragons toy with their food. Other times they just cook it. Be the first to know about new features, when spoilers are uploaded, and more! Unsubscribe whenever. Zero spam, we promise. Wizards of the Coast, Magic: The Gathering, and their logos are trademarks of Wizards of the Coast LLC in the United States and other countries. © 2019 Wizards. All Rights Reserved. Fateseal.com is not affiliated with, endorsed, sponsored, or specifically approved by Wizards of the Coast LLC. Fateseal.com may use the trademarks and other intellectual property of Wizards of the Coast LLC, which is permitted under Wizards' Digital Marketing Asset Policy.